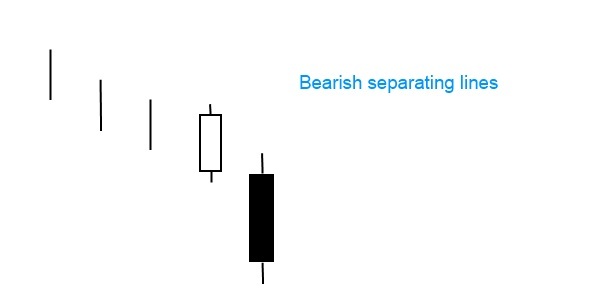 Bearish separating lines pattern appears very scarcely on the candlestick charts. It is considered as a bearish continuation pattern. It is exactly opposite to bullish separating line. It’s a simple two candle pattern. The first candle is a long white one appearing in a downtrend. The second candle is black and opens on the same price level as the preceding one. Although the opening price level is the same, it closes at lower levels. The original Japanese name refers to this reverse movement: “lines that move in opposite directions”. The second candle must be a black opening marubozu. Despite its simplicity, it is a reliable and noteworthy hint. However, before you make any moves based on the signal’s presence confirmation is necessary. A black candle, a large gap down or a lower close may seal the downtrend.